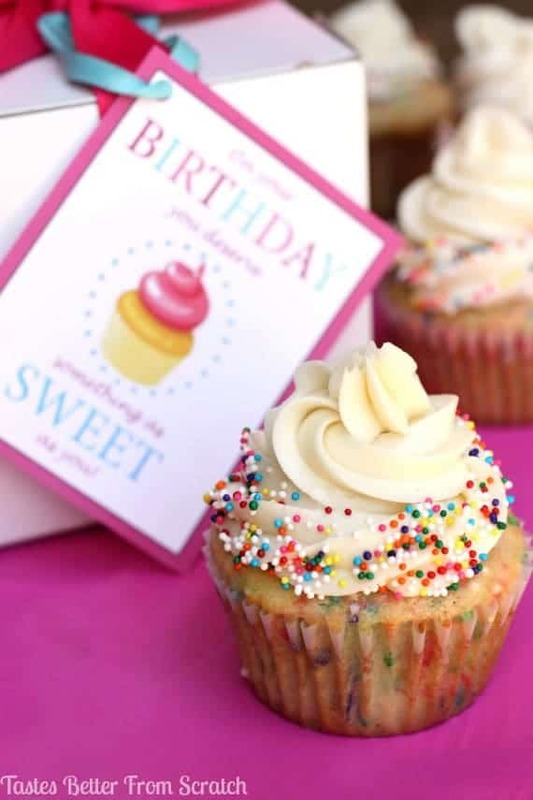 Light, moist homemade Funfetti cupcakes topped with a perfect buttercream frosting are perfect birthday cupcakes! When I was young I always did something big for my friends’ birthdays. Me and my sister would sneak to their house late at night and “heart-attack” their front yard with signs and balloons. Or we would surprise them in the morning with breakfast with several friends. We’d usually always bring a big batch of cupcakes, like these amazing Homemade Funfetti Cupcakes, to school so they could share with their friends. As I’ve gotten older it’s harder and harder to do anything really big for my friends’ birthdays. I still want to show them I love them and I care about them on their special day, but I also need an inexpensive way to do that! 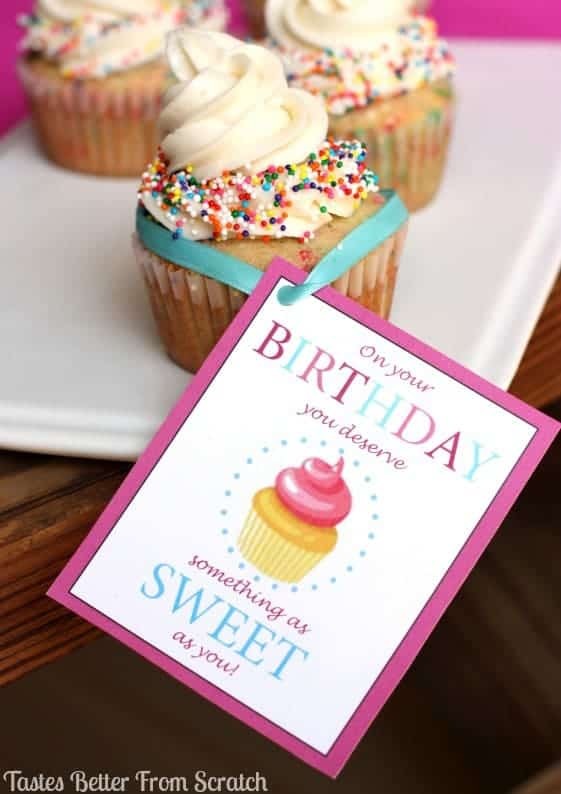 I know lots of people feel the same way, so I’ve teamed up with Kristen Duke on her Birthday Celebration Week, along with 100 other awesome bloggers, to share 101+ Birthday Gift Ideas for your Friends –including my homemade funfetti cupcakes + printable! Most gifts are under $5 (SCORE) and include a free printable! My husband is a huge fan of funfetti birthday cake but he’d always had it made from a cake mix. Once he tried this homemade version, I know he’ll never go back! 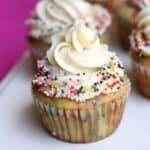 These Homemade Funfetti Cupcakes are light, moist, sweet and perfect!! They’re super easy to make and come out awesome every time! And then there’s the homemade buttercream I use to frost them—that stuff is the best! My family asks me to make extra so we can spoon it onto graham crackers 🙂 . 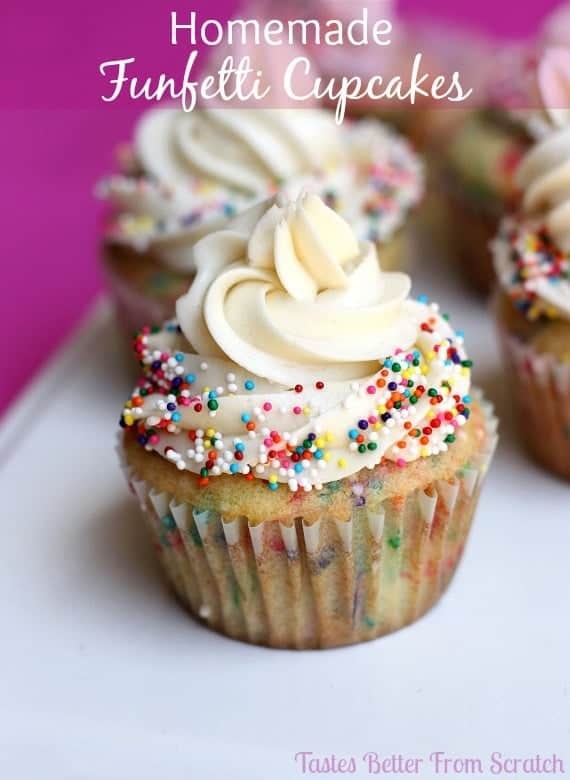 Light, moist funfetti cupcakes that taste so much better than a cake mix! In a large mixing bowl combine flours, sugar, baking powder and salt. Slice the butter into pieces and add to the flour mixture. Mix on low until the mixture resembles coarse crumbs. With the mixer on, add the eggs one at a time, scraping down the bowl after each addition. Add the milk and vanilla and mix until batter is smooth. Fold in the sprinkles with a rubber spatula. Fill the cupcake liners about two-thirds full. Bake for 15-20 minutes, or until a toothpick inserted into the center comes out clean. Allow to cool before frosting. In a mixing bowl cream the butter for 5 minutes until light and fluffy, scraping the bowl down as needed. Gradually add the powdered sugar and vanilla and mix until light and fluffy, about 2 minutes. Frost the cupcakes (I used a Wilton 1M tip) and add sprinkles as desired. Wow these are so pretty and I bet they taste good too! they look like perfect cupcakes! Can you confirm whether this makes 1 or 2 dozen cupcakes? It doesn’t state it anywhere unless I am missing it? Can I table salt ? I don’t have kosher salt?. Thanks, and your recipes look great. For sure, you can substitute table salt for kosher salt, you just want to use a little less. 🙂 Hope you enjoy the cupcakes! What do you do if the kosher salt you have is coarse? Delicious recipe and my daughter loved them for her birthday. Funfetti cupcakes were what my niece requested for her 16th birthday and she and the whole family loved them. They were so fun to make.